Returning to Ashland, OR for it’s 8th installment, the Killer Valley Horror Film Festival (KVHFF) is a celebration of independent horror and science fiction movies from around the globe. 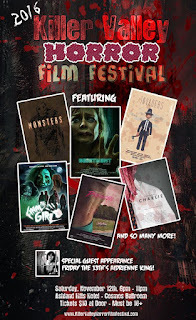 A one-night affair, geared to film-goers 18 years and older, the festival showcases genres that are arguably the most fun for independent filmmakers to create, and provides an atmosphere for horror fans to watch in a more social environment than a typical theater setting. Audiences often dress in costume, and the festival offers Special FX Makeup Booths in case viewers want to feel like a zombie for the night. Local film production companies, along with Southern Oregon Film and Media (SOFaM), will have booths set up to showcase their works. This annual event also features a special appearance by Adrienne King, star of the original “Friday the 13th,” and proprietor of Crystal Lake Wines. Fans can get autographed bottles of her signature blends, all made in the Rogue Valley of Southern Oregon.